By Ludovic Bigot, P. Geo., MSc., and Ludovic Legros, GIT., MSc. Nowadays, multispectral satellite imagery enables high-precision predictive mapping for large territories around the world. Because multispectral optical satellites measure the electromagnetic signal in specific windows of solar radiation — usually in the visible and infrared light spectrums, they offer the ability to identify a variety of minerals, including iron-oxides, iron-magnesium silicates, clays, micas, carbonates, and silica. Cutting-edge analytical methods such as those developed by Effigis drastically increase the precision of mineral targeting, which represents a tremendous benefit for exploration activities. This extraordinary ability to assess a territory’s geology and mineral potential is the result of 50 years of technological progress. In 1972, the NASA launched the first multispectral satellite of the Landsat mission. The place of remote sensing in the area of mining exploration, and more broadly in the field of geosciences, has continuously grown ever since. The arrival of NASA’s ASTER multispectral satellite in 1999 caused a first disruption, as it drastically increased the accuracy of remote predictive mapping, both in terms of spatial resolution and the variety of minerals likely to be mapped. An example of this is ASTER’s several narrow spectral bands in the near and short-wave infrared windows (NIR and SWIR), which are critical for identifying iron-oxides, clays, micas, iron-magnesium silicates and carbonates at spatial resolutions of 15 to 30 meters. As the satellite’s data cover 99 percent of the Earth’s landmass, it has become a must for assessing the geology of vast regions, especially remote areas. A turning point came in 2014 with the commissioning of the high-resolution multispectral satellite WorldView-3, operated by DigitalGlobe. It boasted 16 bands positioned in the near and short-wave infrared windows and enabled the identification of a wider and more precise range of minerals, notably in hydrothermal alterations associated with mineralized systems. A spatial resolution of 1.25 to 3.7 meters for mineral analysis was the main disruptive element in this case. 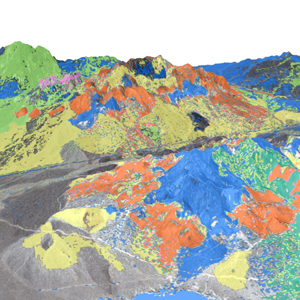 WorldView-3 is now a must for mineral mapping. In order to get the most out of this satellite’s images and achieve greater analytical precision, Effigis has developed an innovative approach that integrates the processing of satellite imagery with the analysis of available geological, geophysical and geochemical databases. Effigis has conducted a mineral study derived from the spectral analysis of WorldView-3 data for the Cuprite Hills area, ​​Nevada. This study accurately identified specific minerals: calcite, muscovite, kaolinite, dickite, alunite and opal (Figure 1). To achieve these results, the team first made sure to calibrate its analysis using spectral field measurements and mineral signatures from spectral libraries. It then used innovative data processing tools to recognize mineral domains. Ultimately, the mineral zones that they had first interpreted were compared to field control points for validation purposes. The precision of their results was stunning: Effigis’ in-house analytical method achieved a correlation rate of more than 80%. 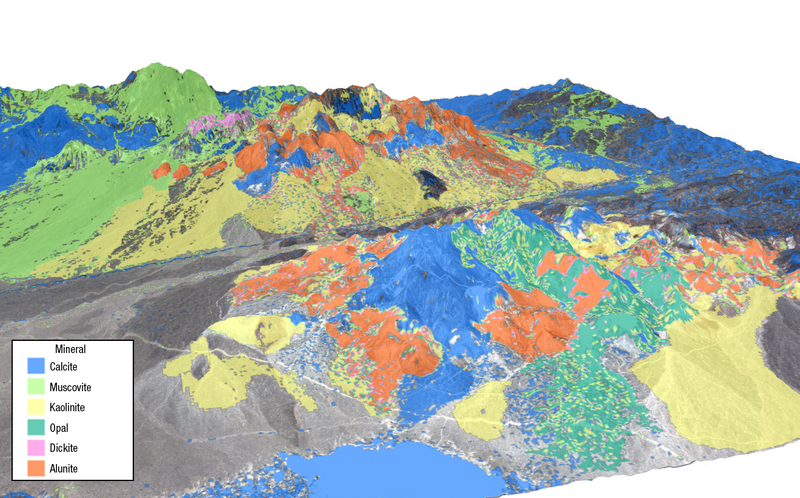 Figure 1: Mineral map derived from the spectral analysis on the WorldView-3 images (50-cm resolution). Cuprite Hills area, Nevada. This unique approach, which combines the newest generation of satellites to cutting-edge analytical methods, makes mining exploration more intelligent, as it minimizes risks while optimizing costs and efforts. From this perspective, such an approach brings about a paradigm shift in the area of predictive mapping.